The 2018 NFL league year is upon us and with that, the hustle and bustle that was the legal tampering period is over and teams can make their reported free agency signings official. With the dust settling from a few hectic days of reports, we at Pro Football Focus take an in depth look at some of free agency’s biggest deals in our exclusive 2018 Free Agency Deal Grader. 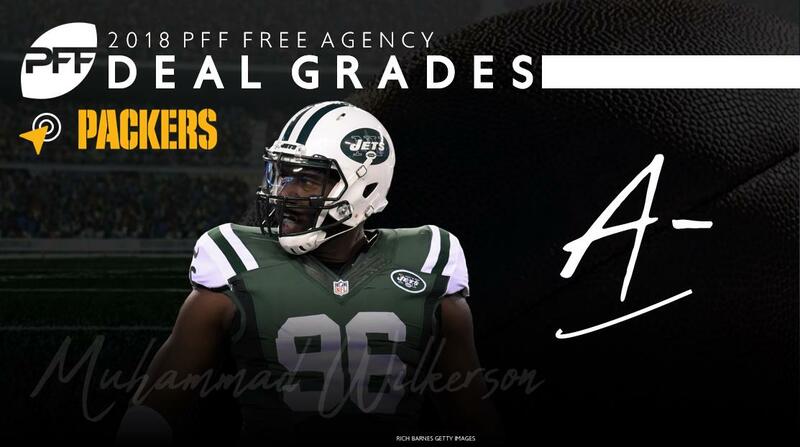 Taken into our deal grades here are many contributing factors, including but not limited to scheme fit for the player signed, contract value and salary cap hit, PFF’s overall grades for both player and team, and several other facets. For more in depth insight all the league’s free agents, check out the 2018 PFF Free Agent Guide, a part of your PFF Edge or Elite subscription. Joining a defensive line with a slew of capable interior defenders on the Green Bay Packers, DI Muhammad Wilkerson may have landed in the best possible spot for him to return to his formerly dominant self in 2018. Packers interior defenders Mike Daniels and Kenny Clark bullied their opposition as a duo this past season, both earning 87.0-plus overall grades and 88.0-plus run-defense grades. As such, Wilkerson should see many more 1-on-1 matchups as a cog in Green Bay’s defense which should give him more opportunities to make plays and re-earn the reputation of being a fierce defensive lineman. Fitting Wilkerson into the rotation at interior defensive line with Clark and Daniels, two high-end run defenders, gives defensive coordinator Mike Pettine a surplus firepower in the trenches to effectively stuff opposing ball carriers at the line of scrimmage. And if Wilkerson can tap into his previous pass-rush successes, Pettine will have quite the interior pass-rush as well. In 2015, easily the best pass-rushing season of his career, Wilkerson recorded 78 total pressures (including 12 sacks) across 575 pass-rush snaps, ranking fourth among all NFL interior defenders. Of the 78 total pressures, 32 (41 percent) were recorded when Wilkerson was rushing outside of opposing right tackle. That alignment has still been successful for him despite decreased usage over the years. Wilkerson’s 10.7 pressure percentage over the past three years (2015-17) rushing outside of the right tackle is far and away his best compared to any other alignment along the defensive line. However, after playing 42.98 percent of his snaps at said position in 2015, he played just 34.2 percent and 13.75 percent of his snaps rushing outside of the right tackle in 2016 and 2017 respectively. With Daniels and Clark at his disposal, Pettine will have the luxury of moving Wilkerson up and down the defensive line while the aforementioned duo handle the interior. And if Pettine wanted to maximize his new defensive lineman’s skills, giving Wilkerson ample opportunities outside of the right tackle might be his best bet. Signing Wilkerson to a one-year, “prove-it” deal limits the risk for Green Bay and gives Wilkerson an opportunity to return to fame before inking a much more lucrative, long-term contract. Both parties should come out of this deal on top.